A cyclist rode past the bike rider counter in the median on Broadway Street. 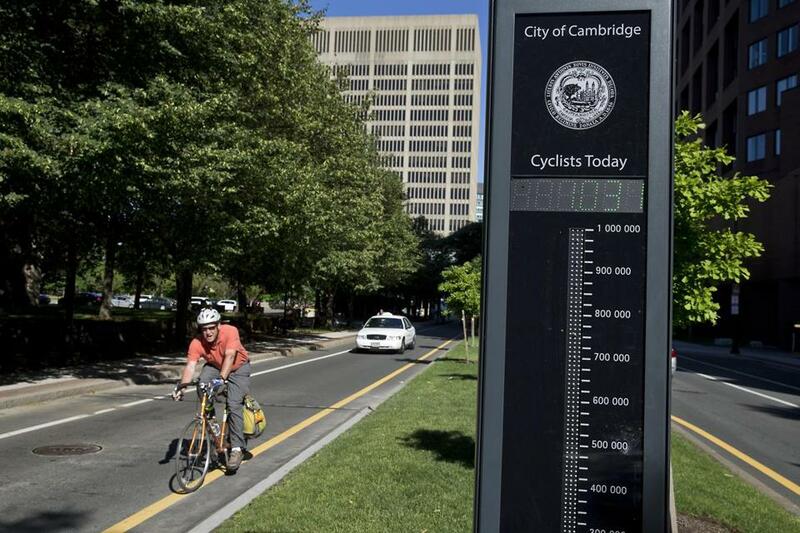 Cambridge has one of the highest percentages of bike commuters in Greater Boston — and now, the city has a way to show it off. If you find yourself biking down Broadway Street in Kendall Square, you can now check out how many cyclists came before you that day. The city recently installed a bike counter that started on Tuesday displaying the number of cyclists who passed through the area, according to city spokeswoman Cara Seiderman. The new contraption, which displays in big green numerals the daily count of cyclists who have passed the spot, will supplement the city’s bike census, taken every two years. During those counts, employees spread out over 17 locations for four hours and record the cyclists they see. The city then extrapolates that data to come up with the number who pedal through the area. Seiderman said they won’t be doing away with the manual count, but officials hope the new bike counter will be more accurate and easier. “We know that a lot of people are traveling by bicycle in Cambridge and that the numbers have been increasing for more than a decade,” City Manager Richard C. Rossi said in a statement. Officials think the counter is a way to show how many people are out biking, and making sure people know “bicyclists count.” But Seiderman said they are also excited about the valuable pieces of data they’ll be able to collect. Officials believe the counter is the first of its kind in the state. With it, Cambridge joins the ranks of such bike-friendly cities as Portland, Ore., and Montreal. The counter from the Montreal-based Eco-Counter company was funded by a $25,000 grant from the Helen and William Mazer Foundation. In three days, the counter had already ticked off about 6,000 bikes, according to Seiderman. Don’t expect to see that big green number skyrocket into the hundreds of thousands: The machine resets at midnight, ensuring a fresh daily count. A less prominent estimate of the annual bike tally will also be displayed. In case you were counting on the T to take you home after a late weekend jaunt, don’t forget: The T is scaling back its late-night service. Starting this weekend, the last subway train will leave the downtown stations at about 2 a.m. on Friday and Saturday nights, which is also the latest time to make the connections between subway lines. The five least popular bus routes will also be eliminated. So if you’re a diehard fan of the 15, 22, 71, 73, or 77 lines, you will need to find a new way home after 2 a.m. Fewer trains and buses will also run, though the difference in waiting times won’t be substantially altered. For example, a late-night Red Line train will now come every 20 minutes, instead of every 15 minutes. The T used to stop its service at 12:30 a.m. on the weekends. Last March, the T started a trial program that extended its subway and bus hours to about 3 a.m. every Friday and Saturday night, responding to pleas from riders and business owners. Though the service was popular with riders, a deficit appeared to threaten the expensive service. After months of speculation, the Massachusetts Department of Transportation board in February approved a scaled-back version of the popular service. Officials said they would continue reviewing late-night service to make changes that would make the program more cost-effective. Don’t get caught in traffic again with all the summer construction. Before you head out, take a gander at all the closings in Greater Boston, courtesy of a “Traffic & Travel Resources” link on MassDOT’s wehsite, www.massdot.state.ma.us.